Though the Australian Open just came to a close, tennis fans flocked to one of the largest sporting events much closer to home for the US Open several months ago as they cheered on tennis legends battling it out on the courts. 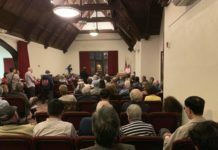 Approximately 700,000 people attend this two-week tournament and, Great Neck South High School ninth-grader Sophia Schutte was among them—but she didn’t have to buy a ticket. 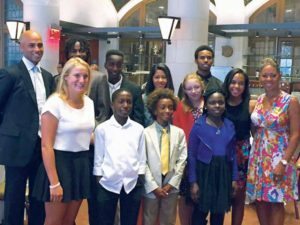 As one of the winners in the 18th annual National Junior Tennis and Learning (NJTL) Arthur Ashe Essay Contest, Schutte and nine others won a weekend of US Open activities. 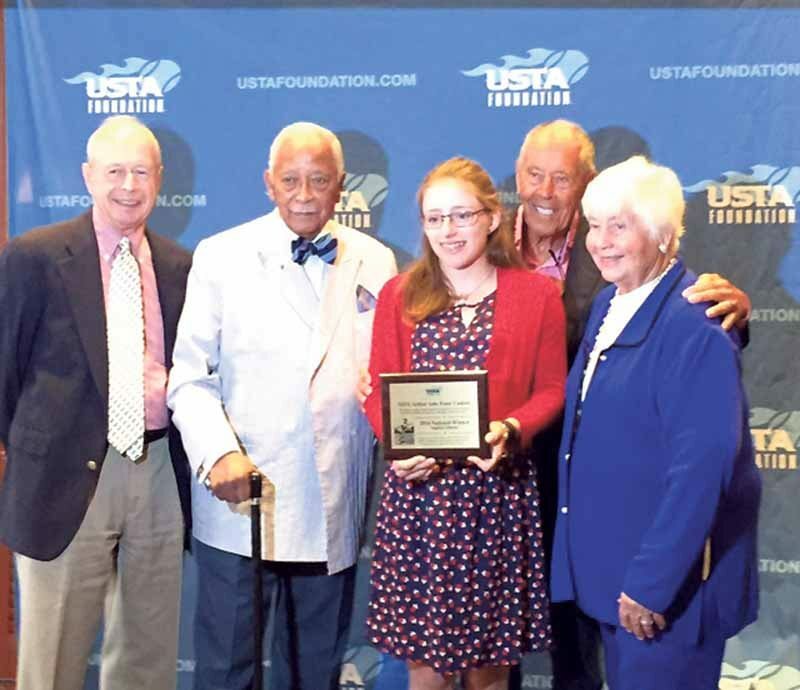 David Dinkins, Nick Bollettieri and the NJTL cofounders flank Sophia Schutte. 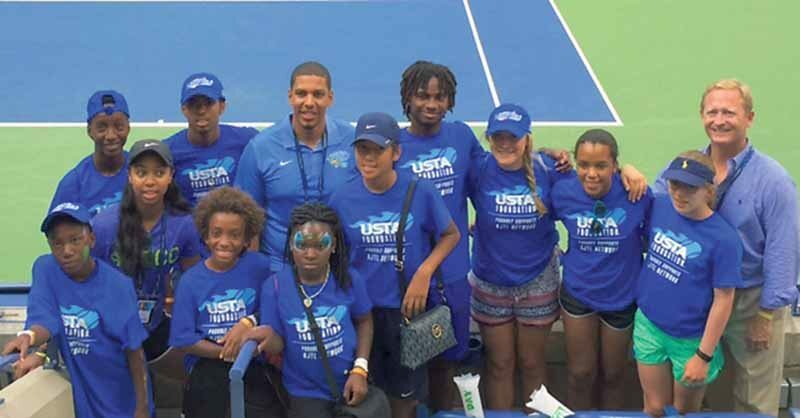 The USTA Foundation, the national charitable organization of the United States Tennis Association (USTA), combined with the NJTL, a national network of 500 community-based tennis and education programs serving more than 225,000 youth, to become a fully operational foundation in January 2014. This year’s NJTL essay contest focused on tennis legend and pioneer Althea Gibson, whose unwavering strength and courage in the face of adversity enabled her to become a trailblazer in the world of tennis as the first African-American Grand Slam and U.S. Championships winner. More than 2,800 short essays written by 10 to 18 year olds were submitted nationwide, addressing the question: How have your skills in tennis impacted the development of your character, and how do you address your personal challenges on and off the court? 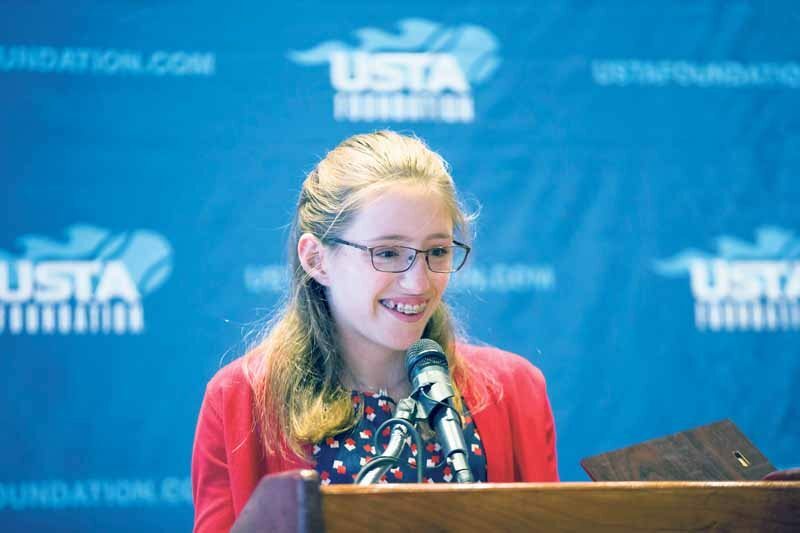 One of only 10 children across the country to write an award-winning essay, Schutte, who hails from Thomaston, said that she wrote about how tennis teaches her life lessons outside of playing the game. James Blake, retired pro and president of NYJTL, and Katrina Adams, USTA CEO, bookend the essay winners. Schutte and the other winners enjoyed a busy weekend with a two-night stay at the Grand Hyatt in New York City, VIP status during the 2016 Arthur Ashe Kids’ Day at the USTA Billie Jean King National Tennis Center and an awards luncheon at the Yale Club, hosted by USTA Foundation Chairman and former World No. 4 James Blake and former New York City Mayor and USTA Board Member David Dinkins. At the luncheon, the essay contest winners each received an honorary plaque. “We had to give a speech, and a lot of people were there, including the mayor,” Schutte said, adding that it was a great experience and she enjoyed meeting the other winners of the contest. The contest winners, including Sophia Schutte (far right), at Arthur Ashe Kids Day with USTA Foundation Executive Director Dan Faber. 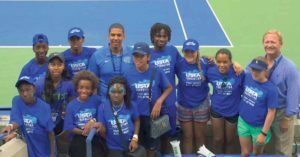 Since then, she’s been attending NYJTL in the Bronx, which she describes as a great program, and is trying out for the girls’ varsity tennis team at South High. 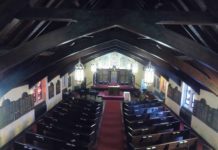 In addition to her love of all things tennis, Schutte also enjoys creative writing and science, and hopes to pursue a degree in science in addition to playing tennis in college. To learn more about the USTA Foundation, visit www.ustafoundation.com. Find out more about the annual essay contest at www.arthurashe.org/arthur-ashe-essay-and-art-contest.html.